FACE A FACE, Always Audacious, Always Unique ! 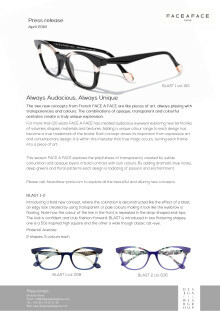 The two new concepts from French FACE A FACE are like pieces of art, always playing with transparencies and colours. The combinations of opaque, transparent and colourful acetates create a truly unique expression. Introducing a bold new concept, where the coloration is deconstructed like the effect of a blast; an edgy look created by using transparent or pale colours making it look like the eyebrow is floating. This new design is introduced with sharper, deeper and yet thinner shapes, creating a new and expressive look. The frame-in-frame effect of the two-coloured front creates an alluring impression - a fine balance of light and thinness.